The washer isn’t a huge energy drain but it is a big water user and depending on the kind of soap you use, it’s a big polluter. So what can we do about our washer? We had to replace our washing machine a few years ago. We bought a regular washing machine but we choose a Fisher & Paykel Aquasmart model because of its energy efficiency and low water use. We’ve been really happy with it, actually. We have young people living with us and have had renters over the years and inevitably someone doesn’t understand basic washing machine usage. Not so with this one. It’s so easy to understand and has worked like a dream. The laundry water pours into the sink next to the washer. We put a large plastic container into the sink and captured the rinse water. The plastic container was left over from a construction project so didn’t cost us anything. It has a handle on it so it’s easier to carry upstairs. We reused the water to flush the toilets. Here’s how we did it. We put a plastic container in the shower in the basement and in the bathtub in the upstairs bathroom. It’s hidden by the shower curtain. We left a regular sized plastic paint can in the room and when we needed to flush a toilet, would fill the paint can with water and pour it into the bowl. Usually one can-full will do the job. It was AMAZING how much water we saved. Here’s the challenge. We’re not so young anymore. It’s hard, with lower back problems, to carry the water upstairs. It is possible to replumb a house for gray water usage but we’re not that rich, or that committed… yet. Our daughter lives in an apartment that doesn’t have laundry facilities. She was always running out of quarters and was looking for a different laundry solution. Again, we turned to Lehman’s. It’s a supplier of products for the Amish, people who don’t use electricity. 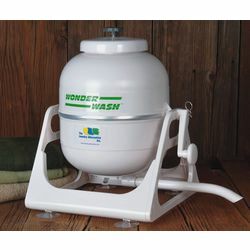 We bought our daughter an electric-free washer, similar but not the same as this model. It operates on pressure created by the heat of the water in a sealed container. We were hoping to give it a try ourselves so we could report on it but it seems to have been broken in one of her many moves. But I’m really intrigued by it. Has anyone tried this or something like it?